The Sir John Guise Stadium will come alive this Sunday with the launch of the FIFA ‘Live Your Goals’ programme. The FIFA Live Your Goals program promotes the increase of girls and women participation in football and hopes to inspire and empower women and girls to believe in themselves. The Live Your Goals programme is part of FIFA’s legacy for staging the FIFA U-20 Women’s World Cup in Papua New Guinea. The launch will coincide with thehost city Walk for Life initiative because of the host city’s stand on promoting the empowerment of young women and girls in the community. The host city governor, Powes Parkop this year declared NCD as a ‘City safe for women and girls’ and has been promoting respect for women through its host city initiatives Walk for Life and Yoga for Life. The FIFA Live Your Goals programme compliments his initiative calling for respect for women as well as inspiring women. Local Organising Committee chief executive officer, Seamus Marten said it would be great to see the residents of Port Moresby at the Sir John Guise stadium to witness the launch. 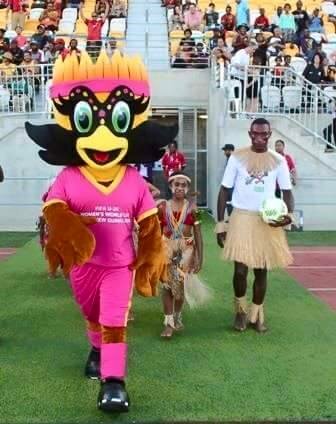 “The U-20 Women’s World Cup is going to be hosted in Port Moresby so we want the residents of Port Moresby to be actively involved in the planned activities to build the excitement in the lead up to November,” he said. The launch this Sunday will commence with the Walk for Life starting at the old Sea Park at Ela Beach then along the Poreporena Freeway and down Waigani Drive to the Sir John Guise Stadium where the launch will be held. The two hour event will involve 200 girls between the age group of six-years to 12-years-old from schools within Port Moresby gathering at the Sir John Guise Stadium to participate in learning basic football techniques from female coaches and women football players. The Live Your Goals programme is one of the key milestones events that the Local Organizing Committee has been working on to promote the theU-20 Women’s World Cup in November.